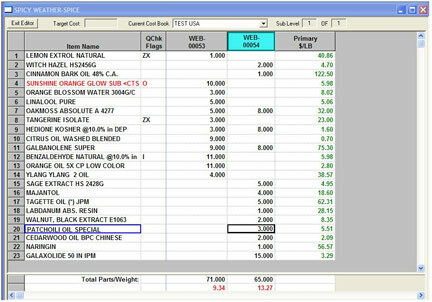 The Fragrance and Flavor Formula Creation and Editing System modules, AromaCIS™ and FlavorCIS™, were developed specifically for the fragrance and flavor industry with the premise that a perfumer's and flavor chemist's expertise lies in creating not bookkeeping. The AromaCIS™/FlavorCIS™ system enables the user to concentrate more energy on the creative process and less on the clerical. Thus, the AromaCIS™/ FlavorCIS™ system achieves increased productivity without sacrificing quality. Below are a few of the system's features. while automatically calculating live values. 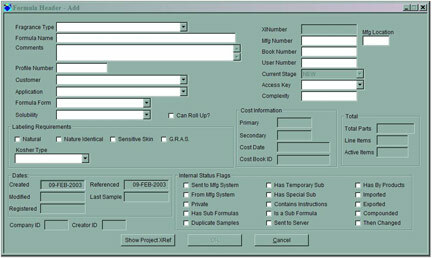 The Formula Header is the screen used to input important indexing and top level information into the system. Searching for a formula is quick and easy using the Formula Look Up Wizard. 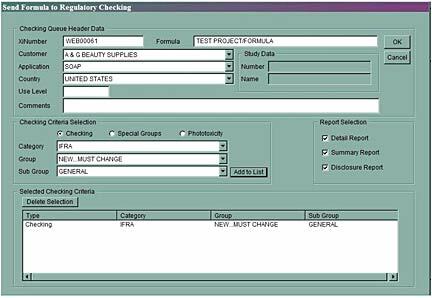 When a formula is finally ready for testing, setting up the testing criteria couldn't be easier than using the Formula Checking System.